In wintry weather the prospect of schlepping across muddy countryside or slipping and sliding up and down the undulating coastal path may not appeal, but there are safer options for enjoying a seasonal walk by water, to enjoy the positive, cheering effects of this special environment. All the following suggestions offer easy parking and walking, plus opportunities for refreshments nearby. There are a number of lakes with managed, level paths which make a good choice for a walk for all the family, including those of limited mobility. Top of the list would be beautiful Lac Drennec near Commana/Sizun, with a 7.5km circuit offering great views of the Monts d'Arrée. There is also a recommended lakeside restaurant with an unusual menu of spicy dishes. 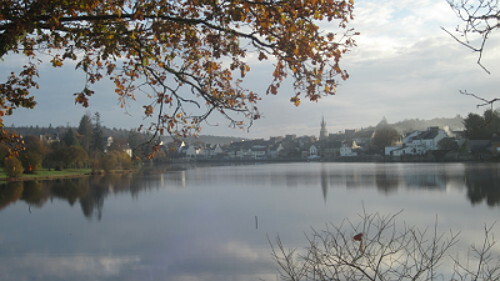 The little town of Huelgoat, famous for its forest walking, ranges around an attractive lake. Allow about an hour for a stroll right round, with plenty of choice of bars and restaurants at the town end. One section of the circuit requires road-walking but the waterside part more than makes up for this. There is also a children's playground on the way. 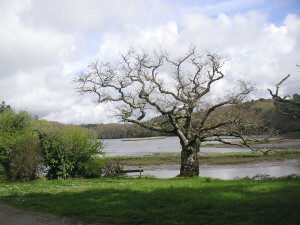 Rosporden in southern Finistère has a series of lakes with well-marked routes for easy walks in close vicinity to the town. The Green Way here (Voie verte No.7 - see the guidebook to Brittany's Green Ways) is also an attractive prospect for walkers and cyclists alike. Estuary walking is another option for solid paths and mostly level gradient. One of the easiest and most scenic is at Pont l'Abbé, south of Quimper. 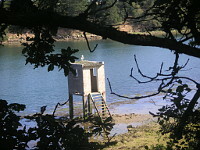 This long trail is popular with bird-watchers, and it includes the Menhir de Penglaouic, half-in and half-out of the water according to the tide. 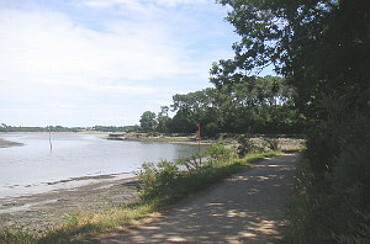 In the north, the Aber Benoit has a pretty wooded path along the southern bank of the estuary, much closer to the water than on the opposite side, but this is a narrow earth path rather than a surfaced track. It is necessary to drive into Lannilis for refreshments. A final suggestion for walking by water would be the Nantes-Brest Canal at Châteauneuf-du-Faou, where the towpath follows a series of sweeping bends in the river Aulne, with wonderful views of the countryside (and the Château de Trévarez). The appealing little town perched on a high hill above the valley has plenty of options for eating and drinking.